Hoppin’ is a self-serve taproom that allows patrons to serve as much or as little beer or wine as they feel like tasting. A wristband keeps track of how much is poured, and patrons pay when they return their wristband to leave. The whole vibe is about keeping it simple, and good beverages with friends. The Dunstan Group offered new ideas that showed we were thinking “outside the box” with the Hoppin’ marketing team. A local office and facility made ideas turn into products that could serve Hoppin’s needs quickly, and the Dunstan Group team always made sure we took responsibility and followed through with what we promised. 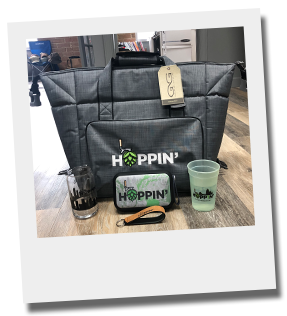 Since a self-serve taproom is such a new concept, especially in Charlotte, the company’s motto is, “Be different.” Hoppin’ management wanted staff gear and merchandise that was creative and made locally, and at the same time, would be gear patrons would like and use again and again. Ability Experience is the non-profit, philanthropic service organization created by the national Pi Kappa Phi men’s fraternity. Their goal is to support and provide activities for persons with disabilities in a way that changes how they’re viewed. 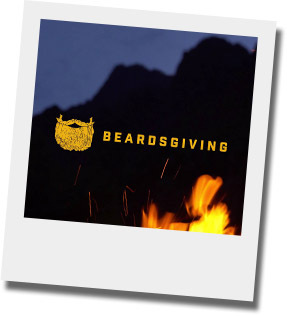 One of their popular fundraisers is “Beardsgiving,” when fraternity members and alumni spend the month of November cultivating great beards as part of an online fundraising campaign. Leaders thought adding incentives might motivate the men in fundraising, but they needed to do it in a way that would “balance cost with cool” as a non-profit. We showed them a mix of merchandise, both traditional and new, that could meet their needs and exceed their expectations. The hats, speakers, mugs, gear bags, and shirts really nailed our goals and we were thrilled. This year we had a record number of guys receiving fundraising incentives, especially at the higher levels. While we work hard to increase the number of registrations we have from across the country, our success lies in how we are able to maximize the fundraising for those that sign up. We absolutely love working with Scott, Brian and MacLean and appreciate their work to impact our mission! Court Creeden has been called a “master of relationships,” and relationships are the foundation of the business he’s built at Parent Financial. Now, he’s offering a book about financial success that’s about a different relationship — the one you have with yourself, and your own ideas about what success looks like. “Almost every single person is trying… to keep up with that sense of what they THINK their life is supposed to look like,” Creeden told Dunstan Group’s Scott Dunstan and Brian Young on their Brandbuilders Podcast. Blue Goat is about living the life you were born to live, and creating your own path to your own personal idea of success. Creeden says his insight comes from being a financial advisor to young couples, many just starting families — the focus of Parent Financial. He realized after talking to so many couples, that their ideas of success were usually set for them by others. In other words, if it looks like your neighbor or friend is more successful than you are, the truth is that they might not really be able to afford the life you see. He blames it on a ‘sheep’ mentality. Creeden hopes people will draw inspiration from Blue Goat to live the “one amazing life” they’ve been given — not to be sheep, but be goats running their own paths, being supportive of those around them who also try to find their own path. And to start building relationships with others — that start with building an honest relationship with themselves. Find Blue Goat on Amazon, and follow on Instagram at @bluegoatlife.